After calling it a day at work and coming back home, it is often difficult to de-clutter the mind and relax. Whether it’s fretting over pending emails, conflicting priorities or agonising about upcoming appraisals, work-related stress is not easy to shake off. It has a tendency to rear its ugly head in the taxing environment of everyday modern life. So how does one take off the edge? Binge on fast food, zone out before the TV, sip a glass of wine, or blow smoke rings. All of these are futile exercises to bury stress and tension. Apart from being unhealthy habits, they can do more harm than good in the long run. 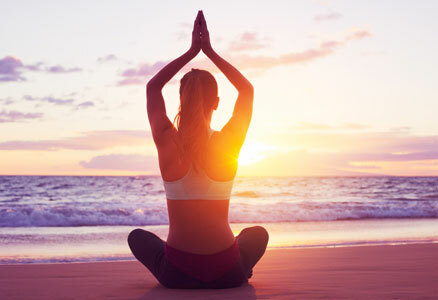 Here are a few healthy ways to clear the mind and rejuvenate yourself after a hard day’s work. The simplest way to relax after toiling at work is to take a soothing bath. A great shower can wash off more than just the dirt and grime on your skin. It leaves you feeling anew. If you have a bathtub or Jacuzzi in your home, you can treat yourself to a great bath. Add 10 to 15 drops of lavender essential oil to a warm or hot water bath and immerse yourself. Some light music on the side can work wonders too. It will ease jangled nerves and relieve tension in your muscles. The delicate fragrance will keep you smelling wonderful. What’s more, it will lull you to sleep so that you can wake up feeling refreshed and recharged the next morning. Yoga is a wonderful solution to calm your worries. Be it Bikram, Iyengar, Sri Sri or the latest power yoga, all forms have the potential to draw out the tension from you. Yoga helps calm mental turbulence and leads to a tranquil state of mind. Hard to believe, but exercise is a great stress buster. Whether it’s brisk walking, biking, jogging, twirling in rhythm, racing on a treadmill, sweating it out at the gym or doing crunches on the floor, any form of exercise makes one feel better. The endorphins released during physical activity can promote feelings of happiness while negating stress. It increases blood circulation, improves muscle tone and flushes out excess toxins. Further, exercise helps you stay fit and strong and achieve your weight loss goals. Another great way to shift focus from office related worries is to stretch. Apart from increasing flexibility, improving posture and circulation, stretching your limbs and body eases anxiety by soothing tight, tense muscles. Moreover, it can be invigorating. An ideal way to clear a foggy head is sipping refreshing, energy-boosting fruit juices. You can guzzle all the sodas you want, or drink a tonne of supplements, but nothing beats fruit juice. Whether packaged or fresh, fruit juice (sans artificial sweeteners and additives) is great for you and keeps you healthy to boot. Reading can soothe your nerves and shift your thoughts away from the day’s stressful activities. Sitting in a comfortable chair and reading a favourite book not only helps you learn more, it is a relaxing and welcome exercise for your brain. Reading has also been shown to help in deep breathing and focusing on the present. Whatever activity you choose to pursue, ensure that it facilitates clear thinking and helps cope with the stress of your daily work life. It should be stimulating, yet make you feel better. You can easily pursue more than one of the activities mentioned. Along with your favourite hobbies, they can help you unwind at the end of the day.